Combined Maritime Forces (CMF) warship, Her Majesty’s Australian Ship (HMAS) Darwin, has seized and destroyed more than three tonnes of cannabis resin. 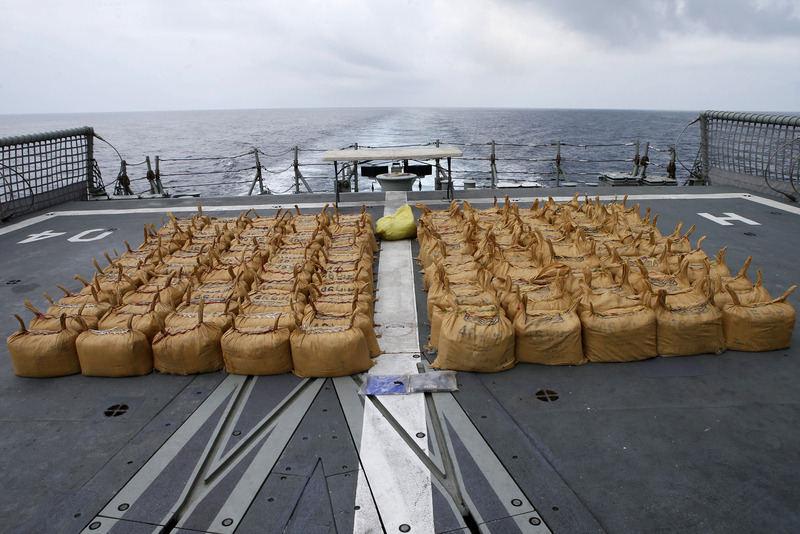 Individual packets of illegal cannabis resin seized from a skiff when it was intercepted by HMAS Darwin conducting patrols of the Arabian Sea. 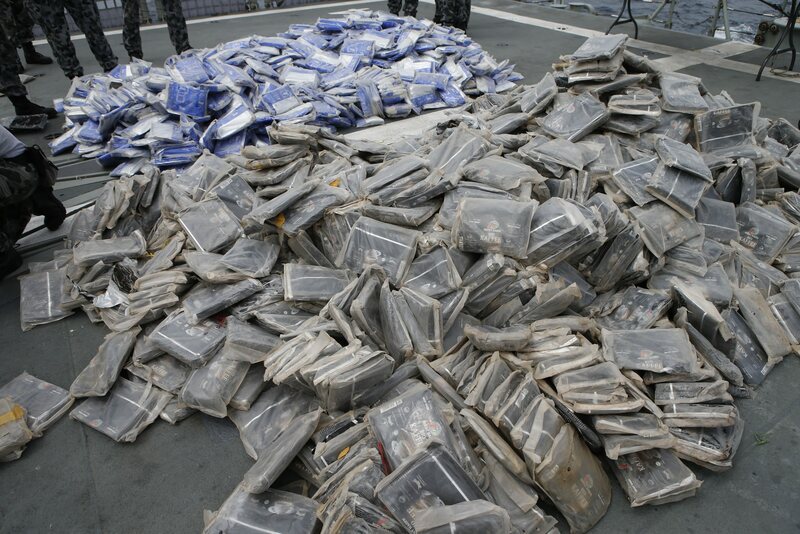 The drugs were found hidden aboard a skiff in the Gulf of Aden on 16 March 2014. HMAS Darwin is currently deployed on patrol under the control of the CMF’s Australian-led Combined Task Force (CTF) 150. HMAS Darwin’s embarked S-70B-2 Seahawk helicopter located a dhow manoeuvring suspiciously. The warship continued to track the dhow into the night and observed what apeared to be a transfer from the dhow to a skiff. 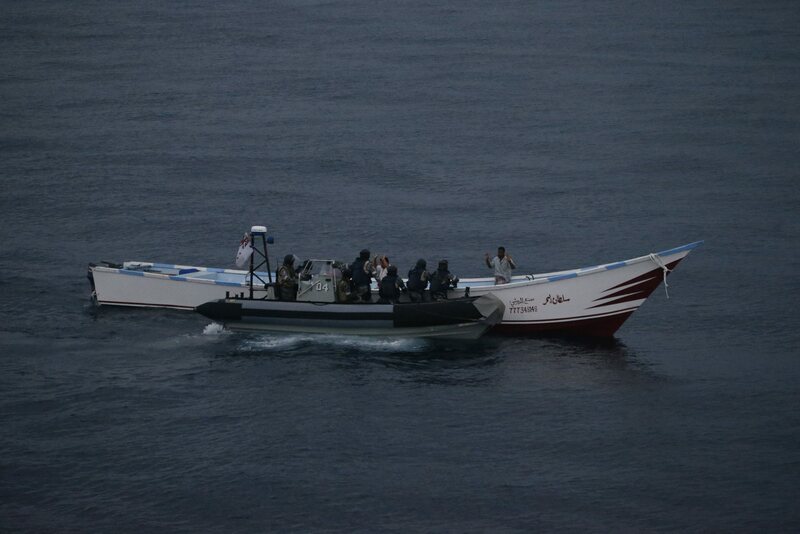 HMAS Darwin’s Rigid Hull Inflatable Boat (RHIB) embarked with members of boarding party come alongside a suspect skiff, which was found to be carrying illegal narcotics. After an hour-long high-speed chase before dawn, HMAS Darwin intercepted the skiff. The boarding party discovered 3012 kilograms of cannabis resin in 151 sacks, each containing approximately 20 kilograms of cannabis resin. HMAS Darwin’s Commanding Officer, Commander Terry Morrison, said the guidance and direction of the Australian-led Combined Task Force 150 and meticulous observation of suspicious activity was key to the seizure. “Today we removed these drugs from potential terrorist funding networks and demonstrated the effectiveness of the coalition effort,” Commander Morrison said. This seizure comes only nine days after HMAS Darwin worked closely with the French Navy, with both units operating under CTF 150, to intercept and destroy approximately 650 kilograms of cannabis resin. A week before that, HMAS Darwin worked with Pakistan to save 13 fishermen shipwrecked and adrift for five days in international waters. The Australian Commander of CTF 150 Commodore Daryl Bates AM said the seizure sent a strong message to narcotics smugglers that smuggling in the Indian Ocean region was not an easy target. “CTF 150 warships have intercepted over 12.5 tonnes of hashish, nearly three tonnes of heroin and several shipments of methamphetamine in the past 12 months,” Commodore Bates said. Combined Task Force 150 is one of three task forces operated by Combined Maritime Forces, a 30-nation partnership based in Bahrain. CTF 150’s area of operation and responsibility spans more than 2.5 million square miles, covering the Red Sea, Gulf of Aden, Indian Ocean and Gulf of Oman.